The Houston Rockets' 138-134 overtime win over the Los Angeles Lakers was the only thing that mattered to James Harden as the reigning MVP poured in another 48 points on Saturday. Harden scored more than 30 points for the 19th successive game to help Houston past a depleted Lakers team that lost Lonzo Ball to an ankle injury. As good as Harden has been during his incredible run, the injury-hit Rockets are only fifth in the Western Conference after winning more regular-season games than anyone last year. So their star man was pleased to come away with a victory on a night when he fell two points short of reaching 50 for the third successive game. Asked if he was playing the best basketball of his career, Harden told reporters: "I don't know, I don't know. "I'm just happy we won." 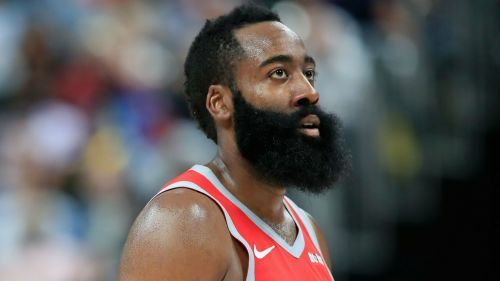 When asked whether he was disappointed not to reach 50 points again, Harden replied: "Nope. We won. That's all that matters." Harden has had to step up for the Rockets in the absence of the injured Eric Gordon and Chris Paul, with Clint Capela also joining them on the sidelines this week after undergoing thumb surgery. Gordon returned in the loss to the Brooklyn Nets on Wednesday and made several key contributions against the Lakers, hitting a huge three-pointer to force overtime and sealing the win by making critical free throws. "It takes a lot of burden off me," Harden said of Gordon's return. "He's so offensively gifted and talented, being able to shoot the basketball, get to the rim, make plays for others. "You get a guy like that on the floor with you it makes the game easier, not only myself but for everybody."